This week has been a week of almost perpetual motion. On Tuesday I went from London to Perth (the one in Scotland, not the Australian one) so that I could be in Perth rested and ready to do a day's training with a really lovely group of people on Wednesday. Then on Thursday, I did the journey in reverse. Six hours each way on the train, not counting time either end getting to and from home/work/hotel made for an exhausting time. 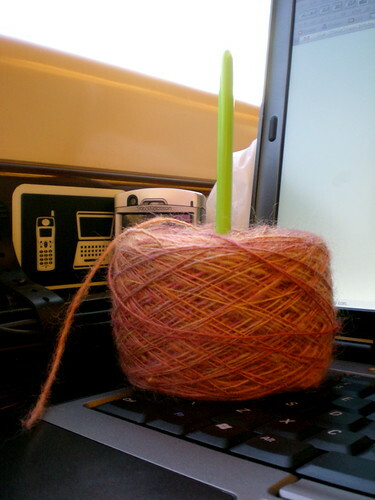 Coupled with having to work on the train, meant that the poor cake of my tequila sunrise hand-dyed handspun was sadly neglected, and came home the same way it went up, along with the 4 balls of Louisa Harding kimono angora, and mostly super secret skein of other stuff I'm doing for someone else (although I did manage to do some work on that in the hotel, before I conked out from exhaustion (training all day is hard work, especially when you're the trainer). So nothing much to show off this week, which is a shame, because I've got lots of things I want to do (and clearly, either an over-developed sense of what I can get done when I travel, or a panic that I'll run out of yarn and be projectless) and other stuff I can't show off quite yet. It's not even like I'll be able to do anything this weekend, unless I manage to get over my travel sickness enough to crochet in the car (I'm on a bit of a crochet trip right now), because I'm off to see my sister, brother-in-law and adorable niece.